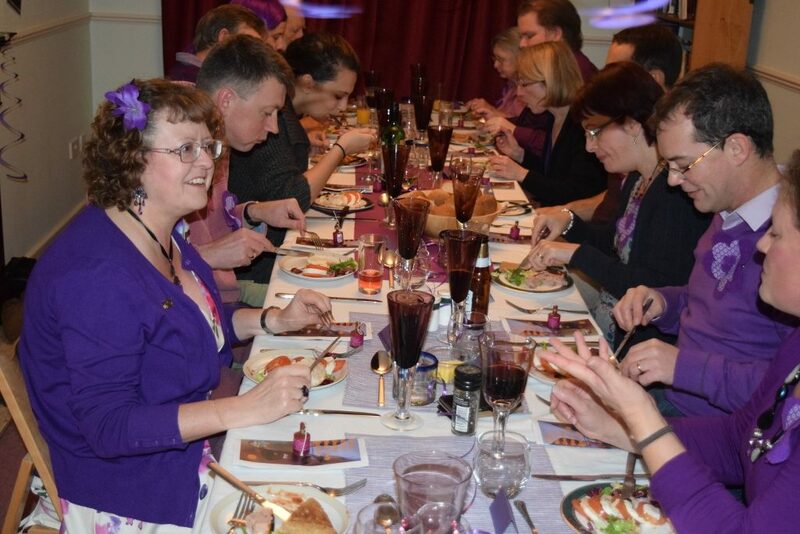 Club members and friends celebrated in purple style with a dinner to raise funds for Rotary’s Polio Campaign on World Polio Day, Saturday 24th October 2015. Purple hair, purple toes, purple finger nails, purple clothes, purple flowers, purple wine glasses, purple napkins, purple decorations and even a purple quiz – all at Karen & Richie’s house after they had shifted the furniture and put up the Club’s trestle tables. Lesley, Carol and Karen led on the catering, Kenneth was the quiz master, Michael S. was on coffee duty, Katy was serving, Richie and Lesley were our photographers, Debs, Carol and Steve put up the decorations, Carol did loads of washing up, Lesley had printed a fantastic set of polio posters and had found a list of famous polio sufferers. Michael S. and Toby came 1st and 2nd in our purple quiz and won some purple prizes. Everyone helped out and it was a great evening. We each paid £15 for our dinner and we kept our costs low so we raised almost £200 for End Polio Now. Of course, we can’t forget the purple cat who was also in charge of the music quiz round and the dishwasher! Photos from the dinner evening can be found here.